The trombone is a musical instrument in the brass family. Like all brass instruments, it is a lip-reed aerophone, meaning that sound is produced when the player’s buzzing lips (embouchure) cause the air column inside the instrument to vibrate. Trombones are usually characterized by a telescopic slide with which the player varies the length of the tube to change pitches, although the less common valve trombone uses three valves similar to those on a trumpet. The word trombone derives from Italian tromba (trumpet) and -one (a suffix meaning large). Thus, a trombone is quite literally a "large trumpet." Trombones and trumpets share the important characteristic of having predominantly cylindrical bores, as opposed to conical bores of such instruments as the French horn. The most frequently encountered trombones—the tenor and bass trombone—are the tenor and bass counterparts of the trumpet. A person who plays the trombone is referred to as a trombonist. Until the early eighteenth century, the trombone was called the sackbut in English, a word with various different spellings ranging from sackbut to shagbolt and derived from the Spanish sacabuche or French sacqueboute. The sackbut was built in slightly smaller dimensions than modern trombones, and had a bell that was more conical and less flared. Today, sackbut is generally used to refer to the earlier form of the instrument, commonly used in early-music ensembles. Sackbuts were (and still are) made in every size from soprano to contrabass, though, then as now, the contrabass was very rare. The trombone was used frequently in sixteenth century Venice in canzonas, sonatas, and ecclesiastical works by Andrea Gabrieli and his nephew Giovanni Gabrieli, and also later by Heinrich Schütz in Germany. While the trombone was used continuously in church music and in some other settings from the time of Claudio Monteverdi (c. 1640) onwards, it remained rather rare in the concert hall until the nineteenth century. During the Baroque period, Johann Sebastian Bach and George Frideric Handel used the trombone on a few occasions. Bach used it in combination with the cornett to evoke the stile antico in some of his many cantatas and Handel used it in Saul, Samson, and Israel in Egypt, all of which were examples of a new oratorio style popular during the early eighteenth century. The repertoire of trombone solo and chamber literature has its beginnings in Austria in the Classical Era where composers such as Leopold Mozart, Georg Christoph Wagenseil, Johann Albrechtsberger, and Johann Ernst Eberlin were featuring the instrument, often in partnership with a voice. Joseph Haydn and Wolfgang Amadeus Mozart used trombones in a number of their sacred works, including two extended duets with voice from Mozart, the best known being in the Tuba Mirum of his Requiem. The inspiration for many of these works was no doubt the virtuosic playing of Thomas Gschladt who worked in the court orchestra at Salzburg. When his playing faded, so did the general composing output for the instrument. The trombone retained its traditional associations with the opera house and the church during the eighteenth century and was usually employed in the usual alto/tenor/bass trio to support the lower voices of the chorus. However, Viennese court orchestra kapellmeister Johann Joseph Fux rejected an application from a bass trombonist in 1726 and restricted the use of trombones to alto and tenor only. This remained the case almost until the turn of the nineteenth century in Vienna, after which time a second tenor trombone was added when necessary. The construction of the trombone changed relatively little between the Baroque period and Classical period with the most obvious feature being the slightly more flared bell than was previously the custom. The first use of the trombone in a symphony was Swedish composer Joachim Nikolas Eggert in his Symphony in E-flat in 1807. The composer usually credited with its introduction into the symphony orchestra, however, is Ludwig van Beethoven, who used it in the last movement of his Symphony No. 5 in C minor (1808). Beethoven also used trombones in his Symphony No. 6 in F major ("Pastoral") and Symphony No. 9 ("Choral"). Leipzig became a center of trombone pedagogy. It began to be taught at the new musikhochschule founded by Felix Mendelssohn. Mendelssohn's bass trombonist, Karl Traugott Queisser, was the first in a long line of distinguished professors of trombone at the academy in Leipzig and several composers penned works for him, including Ferdinand David (Mendelssohn's concertmaster), Ernst Sachse and Friedrich August Belcke, whose solo works all remain popular today in Germany. Queisser almost single-handedly helped to reestablish the reputation of the trombone in Germany and began a tradition in trombone playing that is still practiced there today. 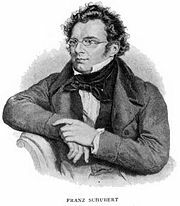 Franz Schubert's 9th Symphony was the first major Romantic symphony in which trombones were given a prominent solo part. Queisser also championed and popularized Christian Friedrich Sattler's new tenorbass trombone during the 1840s, leading to its widespread use in orchestras throughout Germany and Austria. Sattler introduced a significant widening of the bore (the most important since the Renaissance), the innovations of schlangenverzierungen (snake decorations), the bell garland and the wide bell flare, all of which are features that are still to be found on German-made trombones today and were widely copied during the nineteenth century. Many composers were directly influenced by Beethoven's use of trombones, and the nineteenth century saw the trombones become fully integrated in the orchestra. This trend was particularly evident by the 1840s, as composers such as Franz Schubert, Franz Berwald, Johannes Brahms, Robert Schumann, Felix Mendelssohn Bartholdy, Richard Wagner, Hector Berlioz, Gioacchino Rossini, Giuseppe Verdi, Giacomo Puccini, Franz Liszt, Richard Strauss, Anton Bruckner, Gustav Mahler, Piotr Ilyich Tchaikovsky, Nikolai Rimsky-Korsakov, Alexander Borodin, Bedřich Smetana, Antonín Dvořák, Charles Gounod, César Franck, Claude Debussy, Camille Saint-Saëns, and many others included trombones in their operas, symphonies and other orchestral compositions. Schubert's 9th Symphony (first movement) is considered the first symphony in which the trombone section is given a prominent solo part. Orchestras of the Romantic era utilized the smaller bore, higher timbre alto trombone, tenor trombone and bass trombone in their brass compliment. As a result composers wrote the trombone parts in alto, tenor and bass clefs respectively. Then in late nineteenth century brass sections in general and the trombone in particular became more important in the orchestral palette of composers. Richard Wagner utilized the rarely used contra-bass trombone in several of his operas. Mahler's 3rd Symphony includes an extended trombone solo in the opening movement and Ravel's Bolero also features a significant solo passage. The final episode of Mahler's 6th Symphony features a trombone quartet intoning a mournful, dirge-like hymn that leads to the shattering final chord. The late nineteenth century saw the erosion of the traditional alto/tenor/bass trombone trio in the orchestra. While the alto/tenor/bass trombone trio had been paired with one or two cornetts during the Renaissance and early Baroque periods, the disappearance of the cornett as a partner and eventual replacement by oboe and clarinet did not fundamentally alter the raison d'être for the trombones, which was to support the alto, tenor and bass voices of the chorus (typically in an ecclesiastical setting), whose harmonic moving lines were more difficult to pick out than the melodic soprano line. The introduction of the trombones into the orchestra, however, allied them more closely with the trumpets and it did not take long for the alto and bass trombones to be replaced by tenor trombones, although the Germans and Austrians held on to the alto trombone and F or E-flat bass trombone somewhat longer than the French, who came to prefer a section of three tenor trombones until after the Second World War. In the twentieth century the trombone maintained its important position in the orchestra with prominent parts in works by Richard Strauss, Gustav Mahler, Arnold Schoenberg, Alban Berg, Maurice Ravel, Darius Milhaud, Olivier Messiaen, Igor Stravinsky, Dmitri Shostakovich, Sergei Rachmaninov, Sergei Prokofiev, Ottorino Respighi, Edward Elgar, Gustav Holst, Ralph Vaughan Williams, Benjamin Britten, William Walton, Jean Sibelius, Carl Nielsen, Leoš Janáček, George Gershwin, Aaron Copland, Leonard Bernstein, and Béla Bartók. In the second half of the century, new composers began giving back to the trombone a level of importance in solo and chamber music. Pieces such as Edgard Varèse's Octandre, Paul Hindemith's Sonata and Luciano Berio's Sequenza V led the way for lesser-known composers to build a wider repertoire. Popular choices for recital music today include Stjepan Sulek's Vox Gabrieli, Jacques Casterède's Sonatine and Jean Michel Defaye's Deux Danses. The best known trombone concertos from this period include works by Derek Bourgeois, Lars-Erik Larsson, Launy Grøndahl, Jan Sandström, and Gordon Jacob. Numerous changes in construction have occurred during the twentieth century, including the use of different materials, increases in mouthpiece, bore and bell dimensions, new valve types and different mute types. Today, the trombone can usually be found in wind ensembles/concert bands, symphony orchestras, marching bands, military bands, brass bands, brass choirs, and so on. It can be part of smaller groups as well, such as brass quintets, quartets, or trios, or trombone trios, quartets, or choirs (though the size of a trombone choir can vary greatly from five or six to twenty or more members). Trombones are also common in swing, Dixieland, jazz, salsa, rock, R&B, and ska music, though it is in jazz and swing music that it has arguably made the greatest advances since the turn of the twentieth century with famous artists such as Ray Anderson, Tommy Dorsey, Delfeayo Marsalis, Miff Mole, Joe Nanton, Buddy Morrow, Louis Satterfield, Reggie Young, Carl Fontana, Curtis Fuller, Wycliffe Gordon, Urbie Green, Al Grey, Ted Heath, Conrad Herwig, J. J. Johnson, Don Lusher, Albert Mangelsdorff, Glenn Miller, Kid Ory, Frank Rosolino, Frank Rehak, Steve Swell, Jack Teagarden, Bill Watrous, Ron Westray, Kai Winding, and Trummy Young. The Big Bands of trombonists Glenn Miller and Tommy Dorsey were arguably the most famous bands of the Swing era. Trombone virtuoso Arthur Pryor was a key figure in the great band of American music icon John Philip Sousa. The instrument was immortalized in Meredeth Wilson's Broadway musical, The Music Man, in the song 76 Trombones. 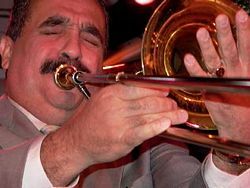 In rock music, the trombone has often been used in the brass sections and arrangements of Paul Simon, Chicago, Blood, Sweat and Tears, the Buckinghams, Toto, the The Beatles, and Frank Zappa as well as numerous Motown and R & B arrangements by artists such as by Kool and the Gang, Diana Ross, and Earth Wind and Fire. As with all brass instruments, progressive tightening of the lips and increased air pressure allow the player to move to a different partial in the harmonic series. In the first or closed position on a B-flat trombone, the notes in the harmonic series begin with the pedal or fundamental B-flat1, followed by B-flat2 (one octave higher), F3 (a perfect fifth higher), B-flat3 (a perfect fourth higher), D4 (a major third higher), F4 (a minor third higher), A-flat4 (a minor third higher; this note is always flat and is not usually played in this position, though it has been the practice in Germany and Austria to do so), B-flat4 (a major second higher), C5 (a major second higher), D5 (a major second higher), E-flat (a minor second higher, but very sharp), F5 (a major second higher). Very skilled players can go higher than this, to G5, A-flat5, A5 and B-flat5. In the lower range, significant movement of the slide is required between positions, which becomes more exaggerated on lower pitched trombones, but for higher notes the player need only use the first four positions of the slide since the partials are closer together, allowing higher notes to be played in alternate positions. As an example, F4 (at the bottom of the treble clef) may be played in both first, fourth and sixth positions on a B-flat trombone. The note E1 (or the lowest E on a standard 88-key piano keyboard) is the lowest attainable note on a 9' B flat tenor trombone, requiring a full 2.24 m of tubing. On trombones without an F attachment, there is a gap between B-flat1 (the fundamental in first position) and E2 (the first harmonic in seventh position). Skilled players can produce so-called "falset" notes between these, but the sound is relatively weak and not usually used in performance. 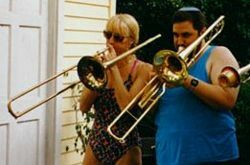 Musician on left with slide trombone; on right with valve trombone. In brass band music, the trombone is treated like all the other members (except the bass trombone) as a transposing instrument in B-flat and reads the treble clef. This puts the notes in exactly the same staff position as they would be if the music were written in a (non-transposing) tenor clef, though the key signature must be adjusted. This is no mere coincidence, for brass bands used to employ a section of alto, tenor and bass trombones in the early to mid-nineteenth century, later replacing the alto with a tenor trombone, all the while notated in the corresponding clefs. Eventually a decision was taken in the early twentieth century to replace the tenor clef with the transposing B-flat treble clef in order to aid new starters to integrate more quickly and effectively into the brass band, though the bass trombone, then in G, remained (and is still) notated in concert pitch bass clef. (Company bands used the B-flat treble clef notation for many instruments in the band to allow players to more easily switch instruments when personnel changed.) An accomplished performer today is expected to be proficient in reading parts notated in bass clef, tenor clef, alto clef, and (more rarely) treble clef in C, with the British brass band performer expected to handle treble clef in B-flat as well. The trombone consists of a cylindrical tube bent into an elongated "S" shape in a complex series of tapers, the smallest being at the mouthpiece receiver, and the largest being at the throat of the bell, before the flare for the bell begins. The detachable cup-shaped mouthpiece, closely related to that of the trumpet, is inserted into the mouthpiece receiver in the slide section, which consists of a leadpipe, inner and outer slide tubes, and bracing, known as inner and outer slide stays. 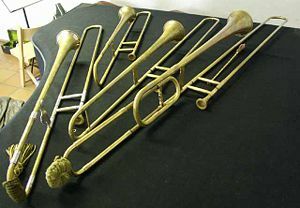 While modern stays are soldered, sackbuts (a medieval precursor to the trombone) were made with loose, unsoldered stays, which remained the pattern for German trombones until the mid-twentieth century. The leadpipe contains the venturi, which is a small constriction of the air column, adding a certain amount of resistance and to a great extent dictating the tone of the instrument; leadpipes may be soldered in permanently or interchangeable, depending on the maker. The telescopic "slide," the defining feature of the trombone allows the player to extend the length of the air column, lowering the pitch. In order to prevent friction from slowing the action of the slide, additional sleeves were developed during the Renaissance and these stockings were soldered onto the ends of the inner slide tubes. Using current manufacturing techniques, the stockings are incorporated into the manufacturing process of the inner slide tubes and represent a fractional widening of the tube to accommodate the necessary method of alleviating friction. This part of the slide must be lubricated on a frequent basis. Additional tubing connects the slide to the bell of the instrument through a neckpipe, and bell or back bow (U-bend). The joint connecting the slide and bell sections is furnished with a ferrule to secure the connection of the two parts of the instrument, though older models from the early twentieth century and before were usually equipped with friction joints and no ancillary mechanism to tighten the joint. The adjustment of intonation is most often accomplished with a tuning slide that is a short slide between the neckpipe and the bell incorporating the bell bow (U-bend); this device was designed by the French maker François Riedlocker during the early nineteenth century and applied to French and British designs and later in the century to German and American models, though German trombones were built without tuning slides well into the twentieth century. Some trombones have valves instead of a slide (see valve trombone). Slide trombone valve attachments may be fitted with rotary valves or sometimes with piston or disc valves, which are modern variations on types of valve invented during the 1820s, but discarded at the time in favor of the rotary valve and the Périnet or piston valve. More often than not, tenor trombones with an F attachment have a larger bore through the attachment than through the straight section (the portion of the trombone through which the air flows when the attachment is not engaged). Typically, for orchestral instruments, the slide bore is 0.547" and the attachment tubing bore is 0.562." A wide variety of valve attachments and combinations are available. Valve attachment tubing usually incorporates a small tuning slide so that the attachment tubing is able to be tuned separately from the rest of the instrument. Most B flat/F tenor and bass trombones include a tuning slide, which is long enough to lower the pitch to E with the valve tubing engaged, enabling the production of B2. Whereas older instruments fitted with valve attachments usually had the tubing coiled rather tightly in the bell section (closed wrap or traditional wrap), modern instruments usually have the tubing kept as free as possible of tight bends in the tubing (open wrap), resulting in a freer response with the valve attachment tubing engaged. Adey, Christopher. Orchestral Performance. London: Faber & Faber, 1998. ISBN 0571177247. Baines, Anthony. Brass Instruments: Their History and Development. London: Faber & Faber, 1980. ISBN 0571115713. Bate, Philip. The Trumpet and Trombone. London: Ernest Benn, 1978. ISBN 0510364136. Blatter, Alfred. Instrumentation and Orchestration. Belmont: Schirmer, 1997. ISBN 0534251870. Del Mar, Norman. Anatomy of the Orchestra. London: Faber & Faber, 1983. ISBN 0520050622. Gregory, Robin. The Trombone: The Instrument and its Music. London: Faber & Faber, 1973. ISBN 0571088163. Herbert, Trevor. The Trombone. London: Yale University Press, 2006. ISBN 0300100957. Maxted, George. Talking about the Trombone. London: John Baker, 1970. ISBN 0212983601. Montagu, Jeremy. The World of Romantic & Modern Musical Instruments. London: David & Charles, 1981. ISBN 0715379941. —. The World of Baroque & Classical Musical Instruments. New York: The Overlook Press, 1979. ISBN 0879510897. Wick, Denis. Trombone Technique. Oxford: Oxford University Press, 1984. ISBN 0193223783. This page was last modified on 18 December 2015, at 17:20.